Barb Palicki is a self-described “old war horse” of a police officer. She worked nearly 22 years in the line of duty with the Toledo Police Department before moving west and joining the force at the Brookings, OR police department where she worked for another 13 years. To put it simply, Barb is a woman who has seen and done it all. The now-retired officer lives in Brookings with her husband, Dan. Being the rough and tumble woman that she is, when Barb awoke one day with a painful sensation running down one side of her neck, she initially chalked it up to typical aches and pains. However, when chills set in, she started to get a little concerned. As her chills and shivering worsened, so did her temperature. In passing, someone mentioned to Barb her symptoms sounded a lot like shock. This gave her cause for concern. 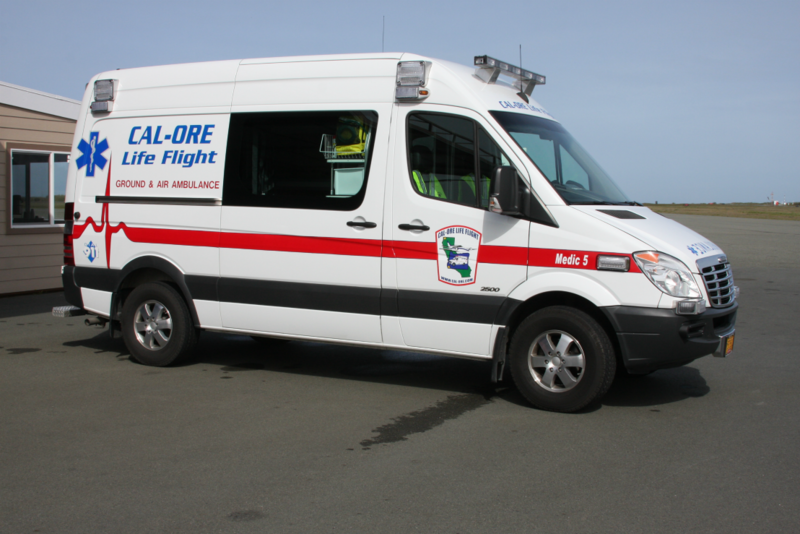 Headquartered in Brookings, Oregon, Cal-Ore offers 24/7 Advanced Life Support transport to destinations throughout Oregon, California and bordering states. Growing worried that her neck pain might be a sign of something much worse, Barb decided it was time her husband took her to the Curry Medical Center for a check-up. There, in true take-charge fashion, Barb gave the clinical staff a full report on what she was experiencing. After hearing her symptoms, it was decided Barb needed a higher level of care than what the local clinic could provide. Thinking that it would be a simple drive down to Sutter Coast Hospital in Crescent City, Barb began to gather up her things; that’s when the medical staff stopped her in her tracks. “When they told me they felt I should go to the hospital, I said ‘Ok, I’ll just have my husband take me,’ but that went over like a lead balloon,” laughed Barb. The staff at the medical center felt it would be safest if Barb took the 45-minute drive by ambulance so paramedics could monitor her condition closely in case what she was experiencing was a cardiac issue. In just minutes, the Cal-Ore Life Flight ambulance was pulling up outside. 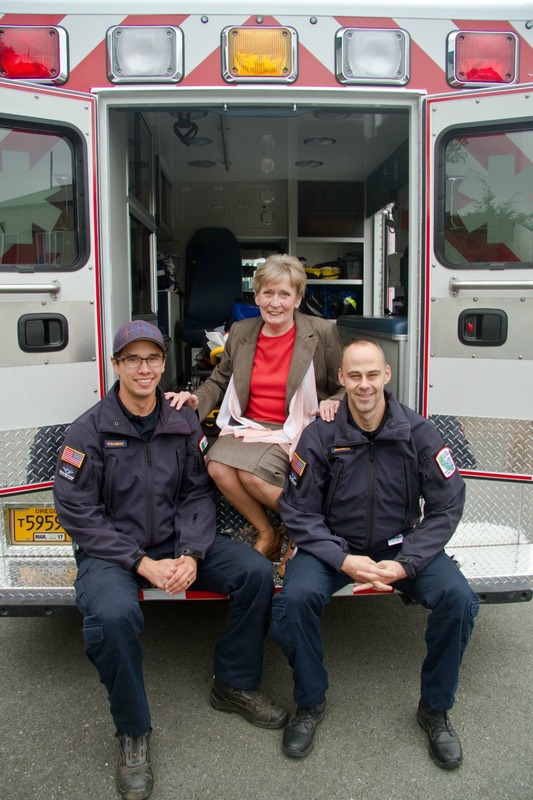 Paramedics Cody Atwater and Bryan Vanderhoof were on duty that day and would have the pleasure of getting to know Barb during the drive down to Crescent City. L to R: Bryan Vanderhoof , Barbara Palicki, Cody Atwater. After Cody and Bryan had Barb safely loaded in the ambulance along with her husband, they set out for Sutter Coast Hospital. Shortly after their departure, Barb’s chills worsened and she asked if they wouldn’t mind cranking the heat up for her. Soon Cody and Bryan were delivering Barb into the hands of the staff at Sutter Coast Hospital. There, her doctors ran a series of tests and determined that she was suffering from a bad infection. Her white count was elevated and her temperature was quite high. However, after some fluids and some antibiotics, she was cleared to go home. Their ride to Crescent City wasn’t the last that Cody and Bryan would see of Barb. This spitfire of a woman lives walking distance from the Cal-Ore base in Brookings and stops by frequently to deliver cookies and treats to the crews and to retrieve her overly-friendly dogs who stop by for pets. “I think they are the greatest people in the world,” says Barb.